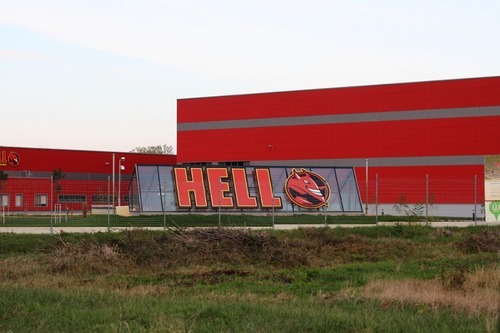 On a recent drive through the Hungarian countryside, I found it: Hell. Uh oh, there it is. (click image to see larger)It was smaller than I expected, and it was slightly more modern. There was one main building, or maybe there were a few buildings very close to each other – it was hard to tell. There were roads in between, and some nice green grass that looked carefully maintained. And, of course, there was a little guard house. Around all of it was a fence. I would have guessed the fence would have been made of stone and had heads or screaming people on it, but instead it was just simple metal. Who knew the devil orders his fencing from the same place as any normal business? There wasn’t and fire. No screams. No flying dragon creatures. Just red buildings labeled “Hell” with a big picture of Satan. There was even an exit for Hell on the nearest roundabout. I always imagined it was a little bit bigger. (click image to see larger)That’s when it hit me. This wasn’t the Hell to which evil people go when they die. It was the energy drink company! Why shouldn’t Hungary produce an energy drink like this? The moral of the story is obvious. If you’re driving through the Hungarian countryside and think you’ve made a mistake that doomed your soul, don’t panic. It’s just an energy drink factory. On that note, don’t act like a video game character and rush in to fight demons, it’s probably just full of factory workers. This is pronounced “poe-coal,” and it means “hell” (at least, that’s what the dictionary told me).